Israel has been forced to cope with waves of terrorism of various types and intensities since its founding and to this day. These waves of terrorism are carried out by various terrorist organizations (Palestinian and Shi’ite) in various arenas (internal, along the borders, overseas) and using various methods (suicide attacks, explosive devices, kidnappings and negotiations, shootings and more). In the decade since the end of the second Intifada, and since the death of Yasser Arafat and his replacement by Abu Mazen, there has been a significant lull in the number of terrorist attacks on Israeli soil, the wave of suicide attacks has subsided and the number casualties from terrorist attacks has diminished. On the other hand, there has been a significant increase in the scope of the threat of high trajectory fire from terrorist organizations in the northern arena (Lebanon) and the southern arena (the Gaza Strip and Sinai peninsula). There have been several developments in recent years that have had a direct impact on the scope and nature of terrorism today and in the immediate future. The first development is reflected in the tectonic changes that have taken place in Arab countries in recent years, known as the “Arab Spring.” The most important changes being reflected in the revolutions taking place in the countries bordering Israel as well as in those in the second and third cycle. These revolutions present Israel with new challenges concerning security issues in general and terrorist threats in particular. A trend became evident, in which these revolutions led to the replacement of a stable, traditional government (even if hostile to Israel) with unstable political coalitions led by, in most cases, Islamist-jihadist radical elements. Such tectonic changes created governance crises in many territories along the border with Israel. These territories constitute fertile ground for the growth and entrenchment of global and local jihadist terrorist organizations, some of which have become platforms for exporting terrorism to regions both near and far. Another development that has influenced the scope and nature of terrorism against Israel in recent years is the strengthening of the Shi’ite hegemony, led by Iran in the Middle East, while it strives to achieve nuclear capabilities. As part of this development, Israel has been accused of offensive operational activities aimed at damaging Iran’s efforts and of involvement in the killing of Iranian scientists and senior Hezbollah militants (Hassan al-Laqis and others). These claims quickly translated into explicit threats against Israel, as well as terrorist attacks and attempted attacks against Israeli targets and tourists in various countries throughout the world (Bulgaria, Cyprus, Thailand, India, Turkey, Azerbaijan and Georgia). A third development was the result of political negotiations between Israel and the Palestinian Authority, which are based on a fragile foundation mediated by the United States and involving, among other things, the release of terrorists imprisoned in Israel – some of whom return to the cycle of violence after their release. The failure of the negotiations and the end of such talks increases the risk of a security deterioration in the West Bank and Gaza Strip, incidents of mass violence (a third Intifada), and waves of various types of terrorism. 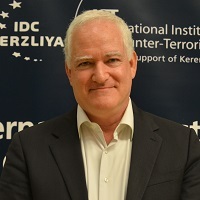 These developments, along with changes in the nature of terrorist threats in various arenas of operation, demand that Israel prepare itself accordingly and design a doctrine of action to provide an adequate response to the challenges developing today and to impact Israel’s security environment in the future. The Southern Arena Israel’s disengagement from the Gaza Strip in 2005 and Hamas’s seizure of the Gaza Strip the following year, enabled Hamas, the Islamic Jihad and other Palestinian terrorist organizations operating in Gaza (including Jaljalat), aided by Iran and Hezbollah, to build an unprecedented rocket system according to Hezbollah’s model along the Lebanon border. This system grew throughout the years and today includes over 10,000 short and medium- range rockets that threaten most population centers in Israel. This system was based on self-produced rockets (Kassam, Quds and Nasser rockets for a distance of 6-10 km, and M-75 rockets for intermediate distances) as well as standard rockets (Fajr and Grad). For Palestinian terrorist organizations, high-trajectory fire is adequate compensation for their difficulty in overcoming the military defense systems and physical obstacles that Israel erected around Gaza, which has made it difficult for them to strike deep within the country. In addition to high-trajectory fire, terrorist organizations have continued their attempt to infiltrate Israeli territory by digging tunnels for the purpose of carrying out terrorist attacks and especially for abducting citizens and soldiers (in light of what they consider to be the successful outcomes of the abduction of soldier Gilad Schalit, namely their continued hold over Gaza and the especially heavy price that Israel was forced to pay for his release). In recent years, and especially after the fall of the Mubarak regime in Egypt, another terrorist threat intensified in the southern arena, this time from Egypt and Sinai, where Islamist jihadist terrorist organizations have taken root and escalated their activities against Israel. These organizations are composed of members of the Bedouin tribes in Sinai, Egyptian radical Islamists, mercenaries that arrived from Arab countries, as well as Palestinian terrorists. Most of the Bedouins in Sinai used to collaborate with these terrorist organizations in the past in return for money, however, after undergoing Islamist radicalization over the years they have become an integral part of these same organizations. After the fall of the Mubarak regime and the release of many terrorists who had been imprisoned in Egyptian jails, some of these individuals chose to flee to Sinai to join organizations and settle there. They were joined by mercenaries who went to the Sinai Peninsula, which they perceived to be an attractive “arena of jihad” against the Egyptian authorities and against Israel. These terrorist organizations (such as Ansar Beit al-Maqdas, the Shura Council of the Mujahedeen, and others) developed operational ties with Palestinian terrorist organizations operating in Gaza and Sinai based on the many underground passages that were dug by Hamas along the border between Egypt and Gaza. These developments significantly increased the terrorist threat against Israel from the Egyptian arena. This threat was reflected in terrorist infiltrations from Sinai to carry out terrorist attacks in Israel, as well as the trajectory fire from the Sinai Peninsula towards southern settlements in general, and towards Eilat in particular. The uprising against General Abdel Fattah al-Sisi in Egypt led to a significant reduction in Hamas’s power, which lost the strategic heartland of the Egyptian Muslim Brotherhood. The determined actions of the Egyptian army against global and local jihadist elements in Sinai, as well as its unprecedented operations to uncover and destroy the underground system built by Hamas along the Gaza-Egypt border, struck a hard blow to Palestinian terrorist organizations in the Gaza Strip, led to a tightened blockade on the Strip, and caused economic difficulties for Hamas. However, it did not result in a significant reduction in the trajectory firing capabilities of these organizations from the Gaza Strip and Sinai Peninsula. The Northern Arena Hezbollah in the Lebanese arena has weakened over the last few years, which is evident in: the political crises that intensified as a result of the murder of Rafik Hariri and the organization’s charge that the international court in the Hague was responsible for his murder; the organization’s international loss of status following the European Parliament’s declaration of Hezbollah’s military wing as a terrorist organization; and, above all else, Hezbollah’s deep military involvement in the Syrian civil war. The move made by many fighters from Hezbollah’s military wing to travel to Syria, under guidance from Iran, in order to defend President Assad’s regime in battle against the rebels resulted in catastrophic consequences for Hezbollah: namely, the attrition of military forces as a result of many casualties, which led to unrest among the Shi’ite population; and the spread of terrorist attacks against Hezbollah strongholds in the Lebanon Valley and Beirut, which were carried out by Salafi-jihadists who came from Syria and Lebanon in order to take revenge on Hezbollah for its involvement in Syria. Moreover, Hezbollah found itself facing increasing criticism, especially from its rivals in Lebanon who claimed that it was endangering Lebanon’s security and sacrificing the interests of the Lebanese people for the sake of promoting Iranian interests in Syria. Hezbollah has established an unprecedented rocket system in Lebanon over the years, with massive assistance from Iran and Syria, which essentially threatens all of Israel (over 100,000 rockets and missiles). However, Hezbollah’s deep military deployment in Syria in the ongoing war of attrition has significantly reduced its ability to handle an all-out war with Israel at this stage. The fear of an uncontrolled military deterioration with Israel (as happened in the Second Lebanon War in 2006) serves as a deterrent, at least temporarily, preventing Hezbollah from carrying out terrorist attacks on Israeli soil. On the other hand, Hezbollah militants fighting in Lebanon are gaining military and operational experience that is liable to serve them well in future military operation against Israel. Furthermore, the Assad regime’s growing dependency on Iran and Hezbollah reinforces the Hezbollah’s position among the Syrian leadership and enables it to arm itself with advanced weaponry (such as long-range surface-to-surface missiles, 17-SA anti-aircraft missiles, and Yakhont anti-ship cruise missiles) and use them to increase the threat against critical facilities in Israel and offshore platforms, such as Israel’s oil rigs in the eastern Mediterranean, as well as influence the strategic balance in the region. Despite Hezbollah’s fear of military deterioration with Israel and its avoidance in carrying out terrorist attacks in Israel (even after its leadership accused Israel of killing senior members of the organization), Hezbollah fighters continue to be involved in insurgency abroad against Israeli and Jewish targets and interests around the world, and seem to have even increased their attempted terrorist attacks in those locations. Syria is currently the country in the northern arena that is most fraught with the potential for serious deterioration in the field of terrorism vis-à-vis Israel in the near future. The ongoing civil war in Syria, and its source of attraction for thousands of Islamist-jihadist volunteers from Islamic countries and communities around the world, is liable to turn Israel’s northern border with Syria, which remained quiet for decades, into a zone replete with security operations and a point of departure for terrorist attacks against Israel by global and local Islamist-jihadist factions (such as Hezbollah). Indeed, in recent months, there have been several incidents of shootings across the Israeli border from Syria, either an unintentional outcome of military clashes between rebel forces and the Syrian army, or an intentional act by Islamist organizations trying to involve Israel in the battle in Syria. Just last week, a 14-year-old Israeli boy was killed in cross-border fire from Syria, marking the first Israeli causalty of the Syrian civil war. In any event, if Islamist rebel organizations establish roots in the areas near the Israeli border, it can assumed that they will try to establish a new arena of jihad against Israel that will attract jihadist mercenaries from around the Muslim world. In light of this, it should be taken into account that the terrorist groups amassing combat skills while fighting in Syria today are liable to be armed in the future with advanced weapons provided to them by various elements outside of Syria as well as with modern weapons looted from the Syrian army (and could even attain chemical and biological non-conventional weapons). Cyberspace As part of the expansion of cyber threats throughout the world, Israel finds itself under repeated attack by anti-Israel elements that, as part of their protest activities against Israel, attack government, public, and private Internet sites. Israel also sometimes falls victim to hacking attacks of computerized databases by criminal elements seeking to commit financial fraud and make a profit. All of these are matters of cybercrime that Israel, as well as other countries, are forced to cope with. The threat here stems from the possibility that members of terrorist organizations, their agents, or sympathizers will use cyberspace to attack critical Israeli military or civilian facilities. Terrorist organizations that act against Israel, such as Hamas and Hezbollah, have long-established cyber-departments made up of local hackers designed to carry out cyber-attacks in Israel. Despite this, the abilities of hackers working for terrorist organizations naturally pale in comparison to the abilities of hostile states operating in this arena, and since Israeli security agencies and national security systems are designed to prevent and thwart potential cyber-attacks by enemy states in the framework of a future cyber-war, the same system should provide an adequate solution to the lower-levels cyber-threats against critical facilities in Israel that stem from terrorist organization activity. The geopolitical processes taking place today in the Middle East and in the global arena do not afford Israeli decision makers and security officials the luxury of remaining stagnant. 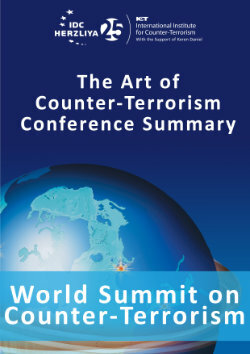 These processes require the development and renewal of counter-terrorism policies, action doctrines, strategies, and tactics to effectively cope with terrorism today and in the future. These changes and adjustments are actually required in all levels of the Counter-Terrorism Bureau – intelligence, offensive and defensive operations, punishment policy, international cooperation, and more. Intelligence operations – The decentralization of the threat of terrorism to many organizations and fragments of organizations operating in areas along Israel’s borders (Gaza Strip, Sinai Peninsula, Syria) as well as areas farther away from Israel (including North Africa, Iraq and Yemen) requires the further development of various intelligence capabilities in these arenas. The propagation of terrorist elements demands a deep understanding of the unique characteristics of each organization, groups or networks that acts, or is likely to act, against Israel. An understanding of the structure of each organization, its decision-making processes, interests, cost-benefit considerations, alliances and rivalries, economic situation, leadership structure, and interior organizational relationships, etc. Security agencies must formulate an individual action policy for each organization and group that is hostile to Israel that takes into account their unique characteristics - the motivations that drive their actions as well as their operational capabilities. Offensive operations – The deployment of terrorist organizations operating against Israel and their headquarters in territories far from Israel require the further development and strengthening of IDF power with an emphasis on its deep offensive capabilities from air, land and sea. Due to the fact that some of Israel’s enemies are located in the sovereign territory of other countries, and because in many cases, Israel shares a common interests with those countries in terms of destroying the capabilities of terrorist organizations operating there (even those countries with which Israel does not have diplomatic ties), Israel must create open or secret channels of communication with these countries and reinforce cooperation in this area. Israel must regard international cooperation as a key element in its fight against local, regional, and global terrorism. Israel must join the international effort to prevent terrorism and, in certain situations, even lead it and harness its needs. The instability in Arab countries, the civil war in Syria, the thousands of foreign volunteers joining the battle in Syria, and the threat of their return to their countries of origin in the Middle East and the Western world, all reinforce Israel’s common interests with many other countries in the fight against global and local terrorist threats. The strengthening of the Shi’ite hegemony in the Middle East, led by Iran, adds another layer to the common interests shared by Israel and Sunni Muslim countries in the Middle East that are working to undermine the Iran-Syria-Hezbollah (Lebanon) axis. Therefore, Israel must plan ahead wisely and weave a shared international fabric in order to effectively combat terrorism. Defensive operations – The governance crisis in territories adjacent to Israel, the creation of areas lacking effective control, and the presence of local and global terrorist groups along its borders, requires that Israel reinforces safeguards and security within its borders – ground obstacles, deployment of military forces, tactical warning and defense systems (including the development of automatic weapons platforms to provide a continuous response to any attempt to invade Israel by air, sea, and land). Hezbollah’s upgraded military capabilities and weaponry demands that special attention be paid to the maritime sector, the protection of Navy ships and civilian offshore platforms (oil rigs). Hezbollah and Hamas’s underground entrenchments (whether for the purpose of concealing weapons, planting concealed launch pads, movement and transfer from place to place, smuggling weapons, establishing command and control rooms, or as a way to pass aboveground checkpoints and infiltrate into Israel) requires that Israel develop technological abilities to locate and destroy these tunnels while posing minimum risk to IDF forces. Despite the significant achievements of Israel’s anti-missile defense system in general, and of the Iron Dome in particular, Israel must prepare itself for military action in the event that terrorist organizations activate a saturated rocket missile system aimed towards Israel from various sectors and areas simultaneously – hundreds of rockets that will make it difficult for Israeli systems to provide adequate and simultaneous defense to critical facilities, army bases and civilian towns. It should be taken into account that in many cases, the rocket fire will be launched near or even within crowded civilian towns in enemy states in a manner that will force Israel to cause disproportionate damage with an offensive attack. This will lead Israel to suffer very severe international criticism, reinforce the de-legitimization campaign being waged against Israel throughout the world, and even result in legal sanctions and claims against Israel and its leaders. A similar outcome is likely to occur in Judea and Samaria if security stability is undermined and leads to mass clashes and a third Intifada. Strategic Revision - The fast evolution of terrorist threats against Israel, and the change in the nature of the threats, challenges and dilemmas facing Israel in its fight against terrorism, require a re-examination of Israel’s counter-terrorism structure, doctrines, and action strategies as well as their adaption to the changing reality. This process of self-examination must be carried out systematically and over time, and not as a one-time activity to improve the current situation. In this context, it must be remembered that terrorist organizations are constantly on a learning curve and countries battling terrorism must not lag behind them in the learning process and in the conclusions drawn from them. Structurally speaking, the strengthening of terrorist threats in Israel’s immediate vicinity, alongside the substantial reduction of conventional military threats, requires that Israel change its intelligence and military system accordingly. This adjustment should be expressed in structural changes through set guidelines of action and authority as well as a different distribution of the defense budget pie as needed. In this framework, Israel must invest in the development of technologies and methods of warfare appropriate for low-intensity warfare in nearby and distant sectors, strengthen its special units and anti-missile defensive and offensive capabilities, and develop new combat doctrines against terrorism with an emphasis on destroying the operative capabilities of terrorist organizations and neutralizing the motivations for supporting them. At the same time, Israel must develop an appropriate doctrine to neutralize the Islamist-jihadist narrative (at least in terms of reducing its influence vis-à-vis Israel) and new ways to enable it to integrate into the overt and covert discourse of the enemy while utilizing new media channels, social networks, traditional communication channels and means of psychological warfare. Israel must re-examine its policies regarding dealing with terrorist blackmail attacks (kidnappings and negotiations, especially in light of the recent abductions of the three teens earlier this month) and formulate responsible policies regarding the release of imprisoned terrorists in situations of a terrorist ultimatum and during times of peace. In summary, Israel’s decision makers must internalize the fact that the ongoing battle against terrorism is a complicated and sensitive one, intimately tied to Israel’s political, diplomatic, legal and PR conduct. On the one hand, the war on terror is a multi-pronged battle involving many enemy players, which requires the formulation of an individual policy for coping with each player as well as a synergetic and integrated policy for fighting them as a whole. On the other hand, the war on terror is multi-dimensional, as it combines military-operative actions to reduce terrorist organizations’ operational capabilities, PR-media-psychological actions designed to win public opinion in the domestic and international fronts (while minimizing, as much as possible, damage in the enemy’s public opinion), and legal actions designed to provide Israeli security forces the scope of action necessary to effectively employ counter-terrorism measures. This complex system of dealing with terrorism requires professional and efficient synchronization of military and civilian agencies with government, public, and private elements, as well as the overcoming of real and psychological obstacles (and above all, obstacles of personal and organizational egos) in order to guarantee that Israel will not only win repeated rounds of battle with terrorist organizations, but also lead to ongoing achievements and perhaps even victory in the overall war against terror.